The Hawks are back in the series, and the bad blood with the Washington Wizards shows no signs of letting up. 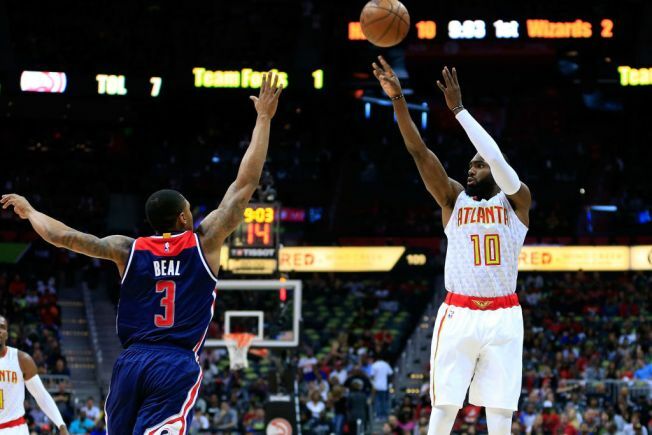 Paul Millsap scored 29 points, Dennis Schroder had 27 and Atlanta delivered an early knockout blow in a 116-98 victory Saturday, slicing the Wizards' lead to 2-1 in the opening-round playoff matchup. After two tight losses in Washington exposed plenty of ill feelings between the teams, Millsap and Washington's Markieff Morris continued to go at it in Game 3. "He's a crybaby," Morris said afterward. "You get all the calls when you're a crybaby. That's how it went tonight." Those comments were quickly relayed to Millsap at the postgame news conference. "It definitely got personal now,'' he replied, before offering some unsolicited advice to Morris: "Take his loss and go back to the hotel, be ready for the next game." Cheered on by a raucous home crowd, the Hawks built a 25-point lead by late in the first quarter and were never seriously challenged by the Wizards. John Wall kept up his dazzling play in the series, scoring 29 points, but he was essentially a one-man team. The other Washington starters combined to score 30 points on 14-of-45 shooting. Beal, in particular, had a miserable night after averaging 26.5 points in the first two games. He was held to 12 points on 6-of-20 shooting, missing all six of his attempts beyond the arc. "That's probably the most I've ever seen him air-ball in one game," Wall said. "He'll figure it out." Game 4 is Monday night in Atlanta. The Hawks came out intent on moving the ball, getting open looks and cutting down on the turnovers that plagued them in the first two contests. Talk about following the game plan. Atlanta pushed out to a double-digit lead before the game was 3 minutes old and stretched the margin to 38-13 with just under a minute to go in the opening quarter on Schroder's 3-pointer. Wall did everything he could to spark the Wizards. He posed along the baseline after a thunderous dunk, which might have had more effect if the Wizards weren't losing by 23 at the time. He somehow made a 3-pointer while falling out of bounds in the corner at the end of the first quarter . He darted through the lane against a collapsing defense to bank in an improbable shot, drawing gasps from the Atlanta crowd. Wall made all but one shot and scored 21 points in the first half, but the Wizards trailed 64-46 heading to the locker room. The other four Washington starters had just 18 points. The Hawks took advantage at the other end. "They jumped on us in that first period," Wizards coach Scott Brooks said. "Their sense of urgency was very high. I wouldn't say we came out relaxed, but we came out missing shots, and we let that affect out defense." Millsap also led the Hawks with 14 rebounds. After playing sparingly much of the season, Taurean Prince moved into Atlanta's starting lineup late in the year. His confidence is growing with each game. Prince scored 16 points, hit a couple of 3-pointers and energized the Hawks with his aggressive play. He even picked up a technical foul for taunting the Wizards after an alley-oop dunk in the closing minutes . "Nothing derogatory," Prince said. "Just being competitive." Millsap praised the rookie for his contribution. "Every time Taurean touches the floor, he's out there hustling," Millsap said. "He's on the ground. He's a scrappy player. He earned himself some minutes. He's starting in the playoffs because of that." Beal has yet to find his shooting touch in the series, hitting just under 40 percent from the field. The Wizards insist they aren't worried. "I like his looks," Brooks said. "I like his shots. He's just going to have to keep shooting `em. Keep getting him open looks, like we have. Every player will go through a stretch of a few games where you're not going to shoot the ball well. He'll bounce back." Wizards: Wall is averaging 31 points per game in the series. ... F Otto Porter Jr. left in the third quarter with a strained neck and didn't return. ... After a video review, Jason Smith was called for a flagrant foul against Millsap late in the third quarter. Hawks: C Dwight Howard remains a non-factor in Atlanta's offense. He scored five points and took just four shots, giving him a mere 15 attempts over the first three games. He did have 11 rebounds. ... Schroder had some issues at the free-throw line, making only half of his eight attempts. Millsap did, too, going 5 of 9. ... Atlanta had a double-digit lead for the final 44:24 of the game. ... The Hawks had just 11 turnovers, a sharp decline from Games 1 and 2.